Definition: A parent who takes an overprotective or excessive interest in the life of their child or children. For example: "Some college officials see all this as the behavior of an overindulged generation, raised by helicopter parents and lacking in resilience." Yeah. An actual dictionary definition exists for this parenting style. It's gotten that bad. Yet, the trend continues and worsens. I see many parents in my private practice on the Upper West Side of Manhattan, exhibiting your typical helicopter parenting, obsessing over their child's success and clearing the path of any obstacles. The children complain but the hovering continues. Recently, however, I'm seeing a whole new level of over-parenting that goes well above the typical helicopter parent. I call this the "Drone Parent." 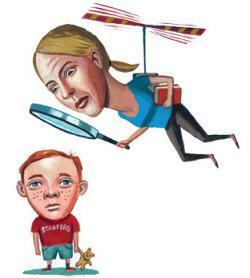 Unlike a noisy helicopter parent, the aerial Drone Parent is silent in their movement, limiting the child's awareness to their presence. Like the drones in Afghanistan, these parents can fly surreptitiously over schools and colleges for weeks and months on end, without refueling and are crazy accurate in their decisive actions. A child may not even know his parents were there. Grades improve from a B+ to an A without the child even knowing why or how that happened. Was the teacher being nice? No, it was the Drone Parent with insistent phone calls to the teacher, indicating their child was dealing with an unnamed "family crisis" and thus should be given a higher grade for their hardship. The teachers are afraid and acquiesce for fear of reprisals if they don't submit to the Drone Parent's will. Helicopter parents beware. You can't compete with the new and improved Drone Parent. Helicopter parenting is over-parenting. Drone parenting takes this to a new level. It stymies your child's independent growth and development. A recent study by Brigham Young professors titled 'Is Hovering Smothering or Loving? An Examination of Parental Warmth as a Moderator of Relations Between Helicopter Parenting and Emerging Adults' finds that regardless of your intention, continually dipping in and out of your child's life to save the day is psychologically and relationally detrimental. No matter how much you say you believe in your kid, your actions say otherwise. Soon, your kids get the message. They don't do conflict. They don't do boundaries. They don't do discomfort.They just don't do much on their own. In my practice I see that parental micromanagement actually causes kids to lose interest in the classroom and lessens the desire for independent learning. Grades and academic success become tied to inadequacy and low self esteem. Self esteem that has been undermined by parents who inadvertently teach their kids that complaints rather than competence are the way to deal with challenges and the unknown. Drone parenting also has a lot in common with a new phenomenon,"snowplow parenting." Drone parents anxiously do all they can to protect their kids from the unpleasantness in the world while snowplow parents actively shove obstacles out of their kids' way to ensure their success. The end goal is the same: to give their kids the world, to actively get it for them rather than show them how to go after it themselves. The result? Kids who burn out, refuse to try, or fail to bounce back quickly because they don't know how to take a hit from life or they don't believe they should ever have to. All this parental micro-management is a recipe for a mental health mess. For you and your kids. Admit it, you're exhausted. On some level you know that the first grade teacher isn't wiping your kid's six year old bottom. You're pretty sure your own parents don't sleep on the floor next to your son's bed until he drifts off to sleep when he naps at their house. And by now, you're pretty confident that the call you made to your 19 year old son or daughter's professor regarding that Psych 101 presentation didn't do your kid any favors. Tell the truth, parenting this way is overwhelming your life. The more you judge your self-worth and social value by your kid's accomplishments and contentment, the less time you have to develop your own. The more energy you spend trying to moderate and mold your kid's friendships and interactions the more unhappy and neglected your own personal relationships have become. Be honest, you know your kids need way too much "help." There is no way you can keep this up forever. At some point, you'll have to let go. Will your child have enough mental muscle built up to walk alone or will your support be a crutch he or she can't do without? Too many beneficiaries of drone parenting struggle with self control and depression throughout their adulthood. Drone parenting is not kid focused. It's parent focused. Do you hover out of fear or parental narcissism? We live in a highly informed, highly comparative age. The way you parent may be subject to a whole host of judgments, theories, and unnecessary comparisons in the space of an hour spent surfing the net. If you're susceptible, you may find yourself drawn into anxiety-based parenting, hovering over your kids' every move, droning on to the other adults in his or her life about how he or should be protected. Or perhaps, you're not afraid for your kids at all. Maybe you just feel the need to ensure they represent you well. You need to excel at this parenting thing, so your reluctance to see them fail is really a strong desire protect your own self-image. It's a bit narcissistic and might be a tough truth to tell yourself, but worth a hard look. Are you shielding your kids from failure because you really want to be a good parent or because you really just want to look like one? Drone parents pay their kids' dues with a credit card. Healthy parents let kids work it off. Healthy parenting is a process of guidance, training, and supporting a child's healthy growth and development mentally, emotionally, and socially in a way that fosters eventual independence. Drone parenting isn't really a process as much as it is a parental takeover, with the main agenda being to help a kid secure "wins" in life without the work. Not sure whether you spend too much time over head, over indulging and overprotecting your kids? You speak for your child. A lot. You answer questions meant for your child. Correct him or her often. You even suggest edits to your child's tweets and posts. You make excuses for your child's bad behavior. The principal, the dean, and the traffic court judge know all about how tired, stressed, and uniquely challenged you child was the day of a particular offense and how passionately you believe your child deserves a second, third, or fourth chance to behave well. You feel obligated to help your kids rise through the ranks of whatever is socially acceptable, sought-after, and superior. Your kids are covered. Name brand clothing? Of course. iPhone 6? What else? A cool car to drive in high school? Done. Insufficient funds? Not for your campus coed. Your credit card? Maxed. You're more agent than parent. You are constantly selling your kid. He or she is remarkable. Amazing even. He's a great student. She's a rare beauty. He's a boy scout. She's loves to spend vacations reading to the elderly. Your child is "tweet"-worthy and Facebook fabulous. As evidenced by your daily posts. Your kid is safe with a capital S. You are the parent that asks the other kids at the park to play elsewhere while your kid is on the slide. Where you'll stand below, catch him, and wipe his hands with a sanitizing wipe. You're the emotional bubble around your precious angel. No one-- no kid, no teacher, no coach, and maybe not even your spouse-- can touch your child with anything unkind or unpleasant without bouncing off you first. You can't go to bed until your kid's science fair project is complete. But you have to work quietly... so he or she can get a good night's sleep. Your back hurts from your dedication to the boy scout motto: Be prepared. You constantly lug everything your kid needs in a backpack or in a bin in the car. Your child shall never suffer a moment without a juicebox or snack ready to go. You always leave enough time in the morning to drop off the homework or lunch box left behind. Neither of you will ever have to endure the embarrassment of tantrums, feeling left out, or looking like you don't have it all together. You've got it covered. You're at your child's school so often you have your own coffee mug in the teacher's lounge. You've done it all: school volunteer, classroom parent, crossing guard. Separation anxiety is not one of your kid's issues. Your child is you... all over again. Your child makes the right friends on the playground, starts on the team, graduates with honors, and gets into an ivy league college just like you, or just like you wanted to. Who's living that life? Your kid or you? Okay. Now you know. Take a breath, don't beat yourself up. You just got caught up in the whirlwind all that hovering created. Come to grips with the idea that failure is the path to some of the best lessons learned. Give your kids that gift. It's okay to save the hugs and soothing talk for after your kids take a few important developmental tumbles. Get a good look at your current parenting landscape and come back down to earth. Your kids need you to be encouraging and grounded, not piloting their flight toward independence for them. George Sachs PsyD is a child psychologist in New York City, specializing in the testing and treatment of ADD/ADHD and Autism. Dr. Sachs offers parent coaching, psychotherapy, neurofeedback training, medication management and social skills groups for children and teens. Dr. Sachs has appeared on NBC, CBS and Vice Television. He is the author of a new children's book called the Mad, Sad, Happy Book: a picture book for preschoolers that teaches about emotions.